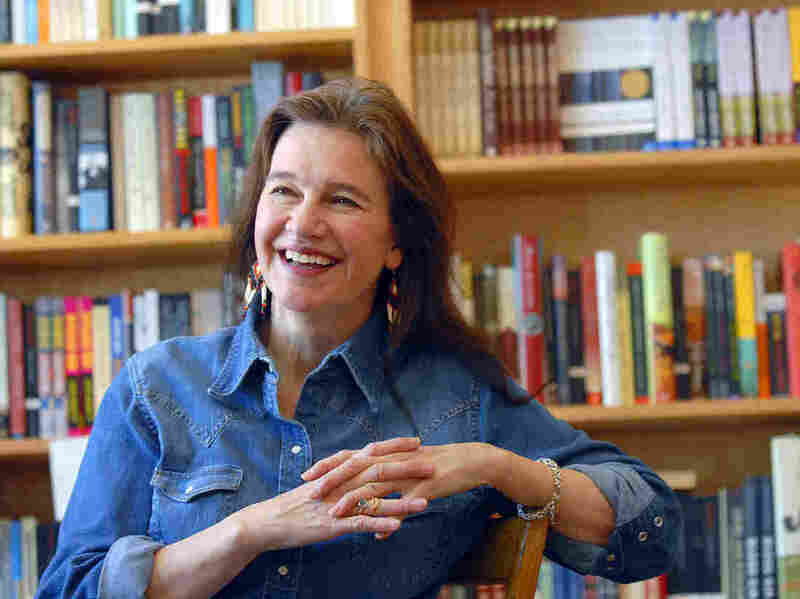 Louise Erdrich's 'The Round House' Wins National Book Award For Fiction : The Two-Way Erdrich's novel is laced with emotional nuance, and demonstrates in painful detail the legal and cultural obstacles to prosecuting rapists on a North Dakota reservation. Katherine Boo's acclaimed Behind the Beautiful Forevers – about life in a slum in Mumbai, India — won the nonfiction award. Author Louise Erdrich, seen here in May 2008, has won the National Book Award for her novel, The Round House. Louise Erdrich's novel The Round House has won this year's National Book Award, beating out a strong field of contenders in the Fiction category. Katherine Boo's acclaimed Behind the Beautiful Forevers: Life, Death, and Hope in a Mumbai Slum, won the nonfiction award. "I would like to accept this in recognition of the grace and the endurance of native women," Erdrich said upon receiving the award in New York City on Wednesday. "In Louise Erdrich's latest novel, The Round House, an Ojibwe woman suffers a savage assault — she is raped and doused in gasoline. Her young son and his friends set out to find her attacker. Reviewer Alan Cheuse writes that this is Erdrich's best novel yet: 'Never before has she given us a novel with a single narrative voice so smart, rich and full of surprises as she has in The Round House.' The book is laced with emotional nuance, and demonstrates in painful detail the legal and cultural obstacles to prosecuting rapists on a North Dakota reservation." Erdrich beat out Junot Diaz' This Is How You Lose Her, a collection of short stories in which he explores the "infidelities, inconsistencies and indescribable joys of love"; Dave Eggers' A Hologram for the King, which offers "elegant commentary on some of our most pressing national anxieties"; Ben Fountain's Billy Lynn's Long Halftime Walk, a book whose prose is "vivid, vulgar and squirming with life"; and The Yellow Birds by Kevin Powers, whose "poetic language gives intimacy and intensity to the conflicts of war, and the conflicts within ourselves." In Behind the Beautiful Forevers, Boo, a New Yorker staff writer, chronicled the lives of the residents of a sprawling slum in Mumbai, India. "Small stories in so-called hidden places matter," Boo said upon receiving her award. Behind the Beautiful Forevers beat out Iron Curtain, Anne Applebaum's exploration of the spread of communism in the wake of World War II; Passage of Power, Robert Caro's fourth installment of President Johnson's biography; The Boy King of Texas, Domingo Martinez' memoir of growing up in a border town; and Anthony Shadid's House of Stone, which tells the story of the late New York Times reporter's effort to rebuild his great-grandfather's abandoned house in Lebanon. The Poetry prize was awarded to David Ferry for Bewilderment: New Poems and Translations. The award for Young People's Literature Award went to William Alexander for Goblin Secret. "The National Book Award in fiction, more than any other American literary prize, illustrates the ever-broadening cultural gap between the literary community and the reading public." But that controversy was nothing compared to the gaffe over the erroneously nominated work, Lauren Myracle's Shine. The judges had meant to nominate Franny Billingsley's Chime for the Young Adult Fiction category. Both books were then nominated before Myracle was asked to withdraw her work. Last year's award Fiction went to Jesmyn Ward for her novel, Salvage the Bones.